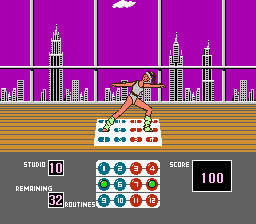 Dance Aerobics is a rhythm game that requires the NES Power Pad. It consists of four main options, including Dance Aerobics; here, you must follow the instructor's movements by tapping the correct buttons on the Power Pad with your hands and feet. There's eight classes in total and each allows for a limited number of mistakes. The game does a great job of easing you into the action by slowly increasing the number of reps you're required to complete in each class, allowing you to build up stamina. The exercises aren't overly strenuous, but I like how the developers switched things up to target different body parts; for instance, there are some lessons that require you to hop, stretch out to the corners, as well as squatting or sitting. What's most impressive is how accurate the Pad is in terms of verifying the split-second you lift your foot off the mat, or place it down; there's zero lag and every movement registers perfectly. It can even tell if you're not putting enough effort in during the hopping tests, as it will add a mistake if you don't leap into the air for long enough! The clear speech samples are another highlight (e.g. your instructor praises you and counts along with the required steps), giving you motivation to keep progressing. Aerobic Studios is similar except you can select a 5, 10, 15 or 20 minute routine; it doesn't offer anything new, but it's good if you fancy a longer workout. Mat Melodies tasks you with playing along to a short tune by using different notes on the Pad; it's not too interesting and there's only five tunes, but at least each is short and recognisable. Ditto challenges you to place your hands and feet in the same position as the computer; it plays like a game of Twister and it's a ton of fun scrambling to get in the correct position before time runs out! Dance Aerobics is an unlikely hidden gem in the NES library, even if you're not particularly interested in health and fitness. The developers managed to eke out the very best from the game concept and peripheral, and the Power Pad requirement makes a huge difference in immersing you into the whole experience. Random trivia: The Japanese version of the game was released two years earlier.